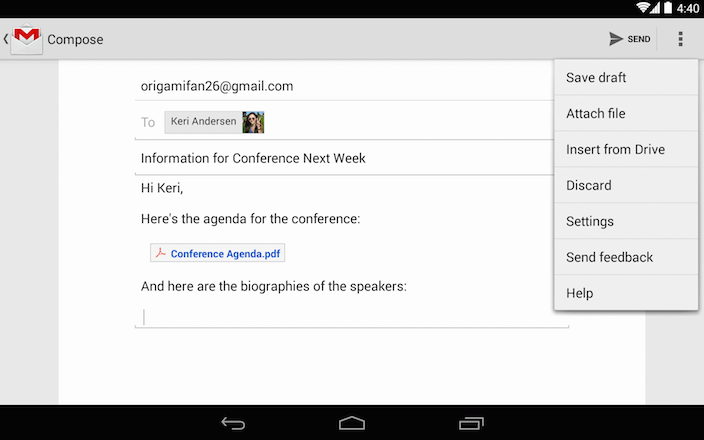 As part of Update Wednesday, Google has updated Gmail. Which is now on version 4.9. This update brings the ability to add Google Drive Files as attachments in emails. Now you can add Google Drive docs from your phone to your Gmail is really easy and convenient. Outside of being able to add Google Drive files, that’s about all we’ve found new in this update to Gmail. No material design or UI updates for the app just yet.So we’ll probably see that update closer to the fall when Android L is available for the masses. The update is rolling out right now as a staged rollout. But we have an APK ready for you to download and get the update on your device right now. For those interested in version 4.9, you can get the APK from the link down below. The update is for Android 4.0 and above and weighs in at about 5.7MB. So it’s not a huge app, but not tiny either.